This paper sets out to present immigrants’ efforts and contributions in making Kano the largest textile trade entrepôt and production centre. It covers the span of seven centuries from pre-colonial, colonial to post-colonial times. This paper argues that immigrants played a central role in the transformation of the Kano textile industry. The transformation of Kano from a tribal backwater to a remarkable textile hub was made possible through the assimilation and integration of different groups of immigrants. Importantly, it discusses the Chinese immigrants’ phenomena in the occupying Kano market, where they forcefully drew back the wheel of Kano textile growth to the disadvantage of the local economy with their competitive advantage. 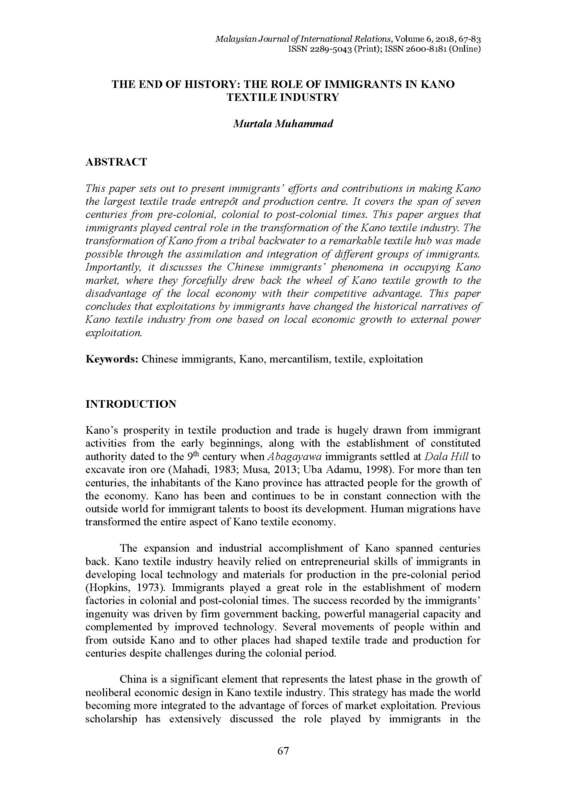 This paper concludes that exploitations by immigrants have changed the historical narratives of the Kano textile industry from one based on local economic growth to external power exploitation. MUHAMMAD, Murtala. The End of History: The Role of Immigrants in Kano Textile Industry. MJIR | Malaysian Journal of International Relations, [S.l. ], v. 6, p. 67-83, dec. 2018. ISSN 2600-8181. Available at: <https://mjir.um.edu.my/article/view/12038>. Date accessed: 26 apr. 2019. doi: https://doi.org/10.22452/mjir.vol6no1.6.